NRB Bank Chairman Mohammed Mahtabur Rahman receives the Bangladesh Bank Remittance Award from Finance Minister AMA Muhith at a function in the capital on Thursday. NRB Bank received Bangladesh Bank Remittance Award 2017 in recognition of highest contribution in remitting foreign currency to the country. 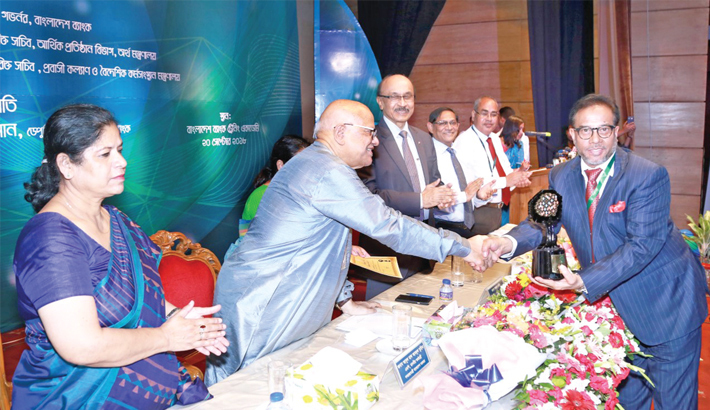 Mohammed Mahtabur Rahman, Chairman of NRB Bank Limited received the award from Finance Minister Abul Maal A Muhith at a function in the capital on Thursday, said a press release.